Suzi Fox, Anna Maria Island Turtle Watch and Shorebird Monitoring executive director, helps Aiden Esformes, 6, of Bradenton, look through a light filter on a card June 14. The film filter allows people to see lights like a sea turtle during a lighting inspection in Holmes Beach. Aiden is the son of Islander reporter/photographer, Chris-Ann Silver Esformes. It’s game on for sea turtle nesting season on Anna Maria Island. 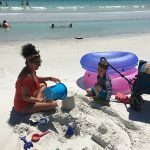 As of June 13, Anna Maria Island Turtle Watch and Shorebird Monitoring reported 187 loggerhead nests on island beaches — the same number on the same date last year. By June 17, there were 223 nests and 238 false crawls. The 2017 season was a record-breaker on Anna Maria Island, with 488 reported nests by season’s end, Oct. 31. 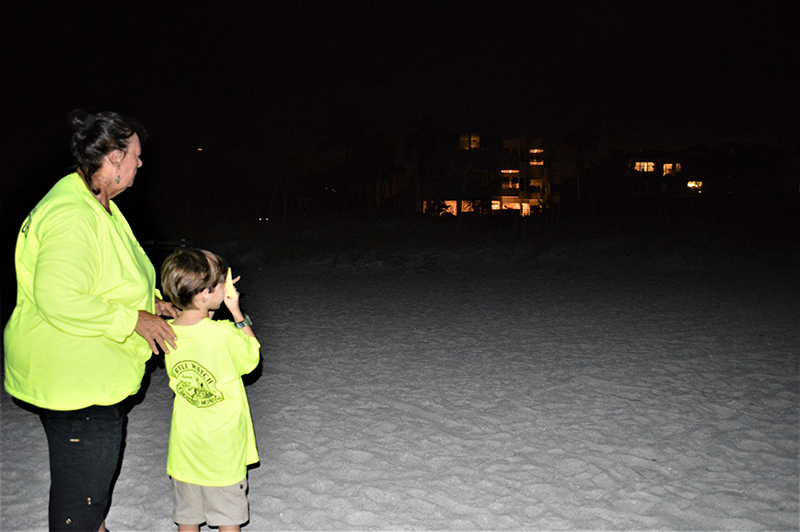 Sea turtles nest mostly at night on dark beaches, so increased efforts to keep the beach dark and smooth have helped AMITW’s success. However, turtle watch executive director Suzi Fox said so far this season, five mature female loggerheads have disoriented on island beaches due to either lighting issues or human interference. 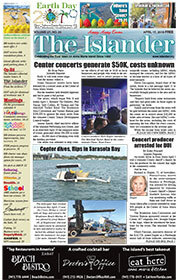 Early June 13, a female loggerhead was found on North Shore Drive across from Bayfront Park in Anna Maria. AMITW volunteers discovered the loggerhead on their morning survey and were able to get the turtle turned around and headed back to the water. The disoriented turtle may have had an adventure, but she did not nest. “Some of the disorientations appear to be due to people on the beach at night not keeping their distance,” Fox said. She said AMITW also has seen an unusually high number of empty nests, which means the turtle dug a hole and started to nest, but returned to the water without laying its clutch. “A false crawl is one thing, but to have someone mess with her after she’s gotten that far, and return to the sea without nesting, is hard on a turtle,” Fox said. She said the first thing people should do if they see a sea turtle on the beach is “put down their cellphones.” She said the bright flash of light could disorient the turtle, which only leaves the water to nest. She also said people should give the turtle at least 50 feet of distance if they choose to watch it nest. “Just let the turtle do her job without interference from you and for goodness sakes, stop taking pictures of her,” Fox warned. She added that unless there is a problem — like the turtle found in the road — there is no need to call turtle watch to report a sighting. Each morning during season, May-October, AMITW volunteers take turns conducting daily beach walks on one of nine 1-mile sections of beach to look for tracks indicating a sea turtle nest or, later in the season, tracks from tiny hatchlings headed to the Gulf of Mexico. Volunteers mark new nests with stakes and tape for protection and data collection. Beachfront lighting is another issue faced by nesting sea turtles. 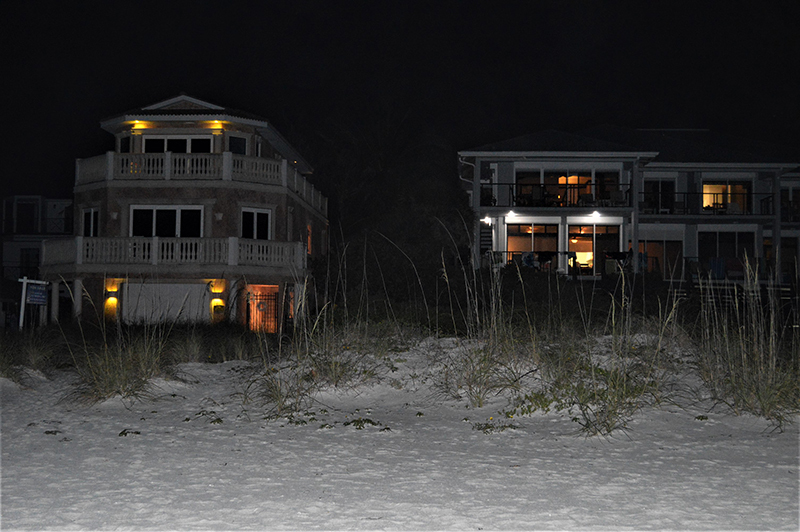 Exterior lights at beachfront properties visible from the shoreline must be low, shielded turtle-friendly lighting and indoor lights should be turned off or shielded by curtains or blinds after dark. Mature female sea turtles only leave the water to nest, so lights visible from the shoreline can distract nesting turtles away from the water. Fox works in advance of nesting season with code enforcement in Anna Maria, Bradenton Beach and Holmes Beach to ensure any possible lighting violations come into compliance. During a June 14 nighttime inspection along the beach in Holmes Beach, Fox spotted several structures with intrusive lighting. 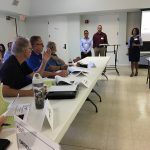 AMITW used grant funds received as a result of the 2010 BP oil spill in the Gulf to outfit waterfront businesses, resorts and residences with Florida Fish and Wildlife Conservation Commission-approved bulbs and fixtures. Fox said she has free turtle-friendly bulbs and can consult with people who may have questions about lighting. “We are here to help,” Fox said. She added that turtle watch does not want to be a killjoy for beachgoers. Visit myfwc.com/seaturtle and click on “Sea Turtles and Lights” or “Wildlife Friendly Lighting” for more information on helping sea turtles. 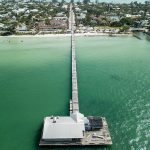 June 19, 2018 Coastal Living: Anna Maria 6th happiest seaside town in U.S.